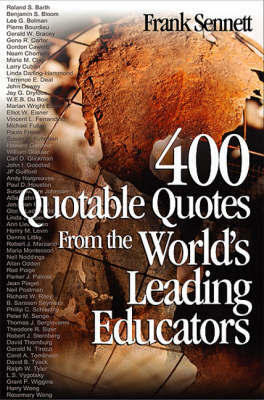 The wisdom of the most widely recognized and leading educators at your fingertips! How many times have you wished for the right words to inspire, persuade, or challenge your peers, your students, or even yourself? Enhance your speeches, proposals, and presentations--and enrich your days--with this unique collection of thoughts from widely recognized leaders in educational theory and practice. With the words of the world's leading educators at your fingertips, you'll maximize your reflection time while passing along a bit of wisdom of your own.